Confessions is available at Amazon, B & N, Apple, Kobo, The Book Depository, and in Walmart and other retailers. I’ve got a lot going on today to celebrate the release, including a blog tour stop at (un)Conventional Bookviews with an exclusive excerpt from the book and a giveaway of the first Renegade Royals book, Secrets for Seducing a Royal Bodyguard. You can join me by clicking this link. AND I’m also celebrating tonight by hosting a party on facebook from 7:30 to 9:30 pm, EST. You can join me right here on my special events page. I’ll be joined by fabulous guests like Valerie Bowman and Kate Noble, who will be chatting with readers and giving away books and prizes. I’ll also be giving out some great prizes, so you definitely want to put on your party hat and stop on by! Guest Author: Katharine Ashe & Giveaway! 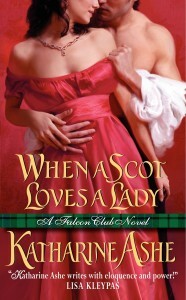 I’m so very thrilled to be hosting Katharine Ashe on my blog today. Katharine is an award-winning author of historical romance who was described by Booklist in 2010 as “one of the new stars of historical romance.” She’s both a talented writer and a truly wonderful person, and she’s here today to tell us about her new book. How To Be A Proper Lady has already been getting phenomenal reviews, and is an Amazon.com Editors’ Choice for Best Book of the Month. Without further ado, let’s talk to Katharine! 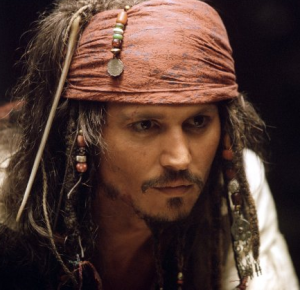 It seems we never lose our love for pirates and privateers – and no wonder, with the likes of Captain Jack Sparrow as a role model! 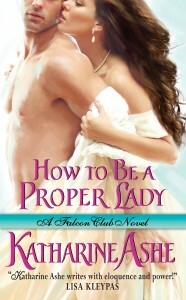 But How To Be A Proper Lady has several unusual twists. Your hero is not your average English aristocrat or even your standard pirate, and your heroine is herself a privateer. How did you come up with such an unusual idea? It’s one of those Crazy Author things, Vanessa. The hero of How To Be a Proper Lady, Jin Seton, presented himself to me pretty much fully formed so I hadn’t much of a choice about who he was. I’d just started writing Captured by a Rogue Lord. The hero of that book, Alex Savege, begins his story as a Robin Hood-style pirate who steals from the rich and gives to the poor. Jin was Alex’s first lieutenant, and from the moment he spoke to Alex in the opening chapter of that book he told me who he was: not fully English, but a man with a brutal history who now sought atonement for the violent deeds of his past. I loved him. And I knew within minutes who his heroine would be: a strong, adventuresome woman, Viola Carlyle, the girl that had been abducted by her smuggler father fifteen years earlier and that everyone presumed dead. In addition to being a fabulous romance writer, you’re also a history professor. Did you draw on any models from the history books in creating the characters of Jinan and Viola? Jin and Viola presented themselves to me after I’d been reading a lot about the shipping routes of the British Empire, and the movements of merchants, navies and slaves across the Atlantic and Mediterranean. Jin’s unsparing past and Viola’s profession came straight from my studies. And their sizzling romance? Well, that came from who they were in their hearts and what they each dreamed of becoming. When you were writing this book, did anything surprise you? Any strange bits of research? Did the characters take you in unexpected directions? Oh, yes! They took me to the Caribbean islands of Trinidad and Tobago, which admittedly I’d anticipated. But what I hadn’t understood before was they couldn’t just sail down the U.S. coast from Boston; air and ocean currents required ships to sail east first, to Bermuda, then south. Also, because Jin does manage to haul Viola back to England and return her to her aristocratic roots, I learned alongside my poor sailor heroine a whole lot about the accomplishments expected of a proper lady in that society. Poor Viola! I suffered with her through every lesson in French, watercolor painting and etiquette that she was forced to endure. Let’s say you were kidnapped by a ravishing pirate and taken to a deserted island. What two luxury items would you beg him to let you take, to make your stay that much more enjoyable? I will respond to this question when my heart reenters my body. I mean, really, where does a girl I begin??? Satin sheets and a refrigerator filled with champagne! But beautiful, bold Viola Carlyle doesn’t care about the rules. And she desperately wants to kiss the notoriously tempting Captain Jin Seton, the man who brought her kicking and fighting back to English society. Kidnapped as a child, now she longs to return to that life of freedom where she was able to live—and love—as she wished. Having hunted Viola for two years, Jin Seton has finally found his good luck—for by finding Viola his oldest, deepest debt will at last be paid. And although he has vowed not to let her win his heart, this very improper lady might finally be the one who tames him. Thanks for the great interview, Katharine. I have to say, How To Be A Proper Lady has moved to the top of my TBR pile! Readers, be sure to check out Katharine’s website for all the details and buy links, and to read an excerpt. Katharine is also generously giving away copies of her previous books today. For a chance to win a copy of When A Scot Loves A Lady or Captured By A Rogue Lord, tell us what your favorite pirate movie is. My all-time favorite is Captain Blood, but I’m partial to space pirates too, like Han Solo in Star Wars!